The thoracic jacket is a supportive tool that helps maintain healthy upper spine alignment. It keeps the shoulder blades relaxed away from the ears, the chest lifted, and encourages the head to lean back and line up with the upper back. I used it daily, not too long ago, when I struggled with chronic nerve impingement. I had lots of tingling, numbness and nerve pain down the arms. The sensations were especially uncomfortable when I slept on my side – for a 6-month period, I didn’t sleep through the night because of nerve pain. My condition was probably encouraged by years of working with microscopes and computers for long periods of time, and exacerbated by two car accidents. It also wasn’t helpful that I folded up in a car, 4 days a week, to drive to work from Oakland to San Jose. I had lost all the natural curves in my spine. The thoracic jacket was helpful in scaffolding my upper back, supporting me in healthy alignment so that my body could relearn a better way of being. 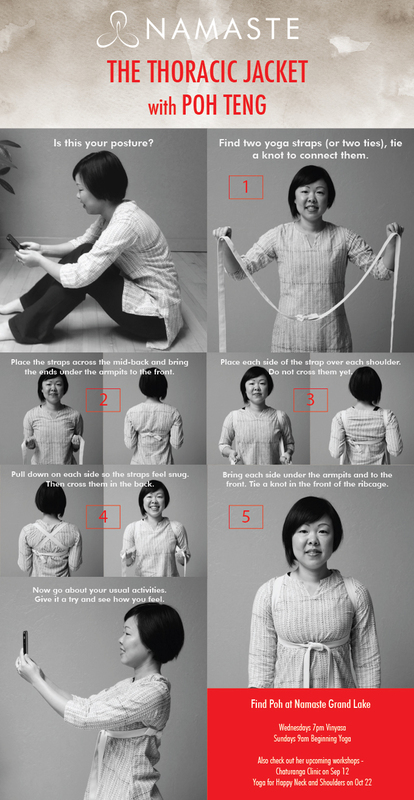 If you’re looking for relief from neck pain or shoulder pain, or maybe you’re just trying to neutralize text neck, I hope you’ll put on the thoracic jacket and go about your usual activities. Give it a try and see how you feel. I have found it useful on days when I do a lot of writing or when I learn a new chant with my harmonium. It’s not so great on days when you have to dress up for the office, and it’s particularly annoying if you like wearing nicely pressed, wrinkle-free clothes.